Professional alterations for the entire family, serving you since 1983. Specializing in bridal and formal wear. 2015 brought lots of new male clients! A resurgence of young professional males focusing on fit and style is a welcomed change. Men have needed to "step up their game" for a long time. Slouchy pants, oversized shirts, and Dad's ill-fitted jacket need to be permanently put to rest! I'm pleasantly surprised and find it encouraging when male clients get excited over a nice fabric. A great look develops a great attitude, more confidence, and respect. Why settle for anything less? Grooms and groomsmen need suits tailored-just as bridesmaids need gowns fitted. Many times I have seen wedding pictures with bridesmaids looking great, while the groomsmen could use some help. Pants are long and breaking badly on the shoe, and jackets are too big with sleeves too long. This combo doesn't make for the best memory album. A big trend now is buying a suit vs. renting a tuxedo and this has aided in the decline of well fitted groomsmen. The suits are usually inexpensive and not the best fit and many young men simply don't know how a suit should fit. The bride and groom play a big part in making sure their wedding party has been fitted correctly. In summary, I love to see the male client excited about properly fitted clothing. And yes ladies, some men want to stare at themself in the mirror and not take it off-just like we do! 2014 was a great year. I call it "The Year of The Bride and Pregnant Bridesmaid"! We fitted a lot of both! I hope I'm wrong in thinking that there can't be any brides left for 2015! We had so many beautiful gowns - LOTS of lace and beading. Please be aware that when you choose a gown with lace and/or beads, the cost of alterations will increase. We are a service - all we sell is time. Relacing and rebeading can double the amount of time spent on one gown. A 2015 trend on bridal gowns is the handkerchief style hem with a wide horsehair braid finishing off the ends. This too is a time consuming alteration. When choosing the perfect gown, focus on the style that makes you feel special while making a mental note of alterations required for a custom fit. This could be the decision maker between two beautiful gowns. Your bridal expense plan should budget $400 for gown alterations. This seems to be the average cost for bodice work, bra cups, hem, and bustle. I cannot stress enough the importance of a well fitted, correctly altered gown! The fit of your gown can set your mood for the entire day. Your gown's fit should be the least of your worries on your wedding day! We prefer eight to ten weeks for bridal alterations and usually three fittings. Rushes are always accomodated - we haven't missed a wedding day yet! January began our 33rd year of doing what we love. 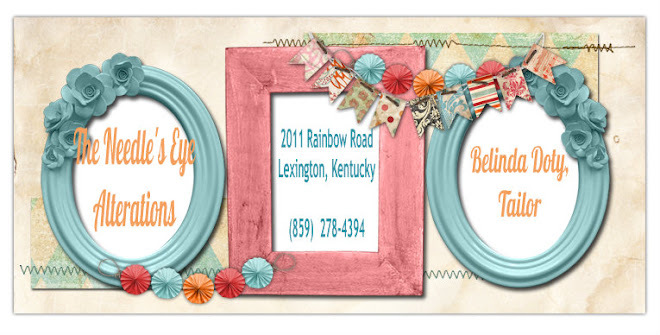 Call for your appointment (859-278-4394) and have a "FIT" with us! After numerous "re-dos" on bad alterations from other alteration shops - I would like to show the untrained eye the difference between correct and poor alterations. Completed alterations should look as if the garment was never touched. 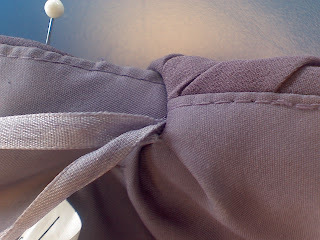 Above is an example of poor side seam alterations done at a local alteration shop. The front doesn't match up with the back at top of garment. 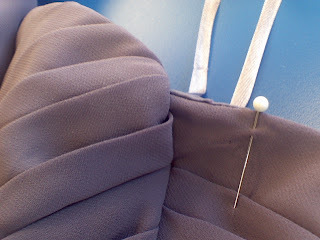 There are numerous puckers from trying to work in fulness without opening the side seam and doing it correctly. The lining panels don't match up. It is bulky. Thread color is obviously wrong. 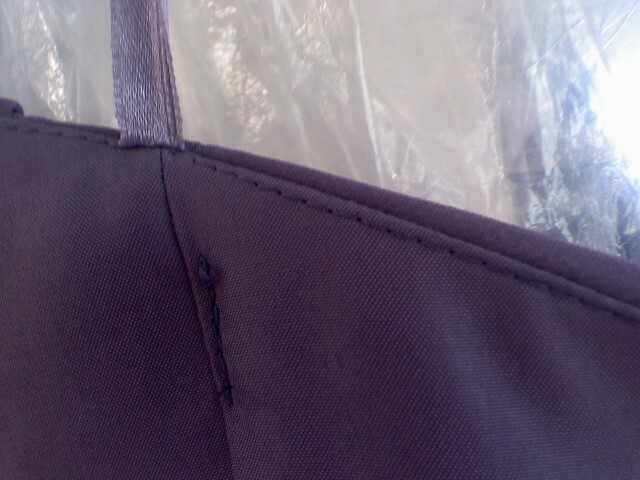 Above is an example of correct side seam alterations. Everything is smooth and not bulky. It all matches up and thread color is correct. This alteration was done at my shop. Above is an example of a horrible chiffon hem done at a local alteration shop. The top row shows wrong side of chiffon and bottom row is the right side. 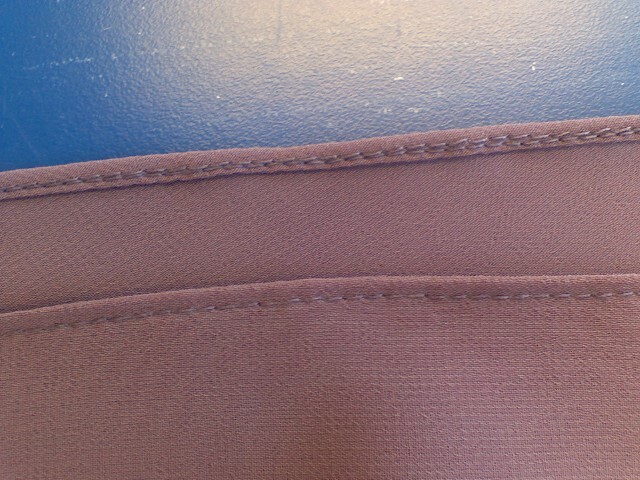 The raw edge has been serged with a white thread. Thread tension and stitch length are incorrect. 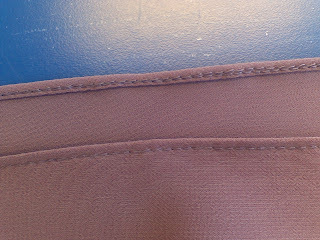 The color of thread used is wrong. Chiffon flows when walking and the inside of the hem becomes very visible - meaning the wrong side should look as good as the right side of the hem. Above is an example of my chiffon hem. The thread is correct color, the raw edge of the chiffon is folded under and the wrong side looks as nice as the right side. So how do you know if your alteration shop is doing a good job? Take a picture of the seams before alterations and compare them to after alterations. If you can't see a difference, then it's a good job. Do you even care about the quality? Expense of alterations can be very cheap if you don't really care about how it looks. If you are going to take the time to have your garment fitted, then I must assume that you care about the outcome. 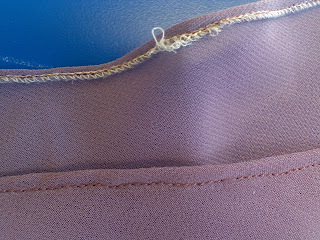 It's very frustrating that some alteration shops do shoddy work under the guise of professional alterations. Whatever happened to taking pride in what you do? With Spring rapidly approaching (YES!) 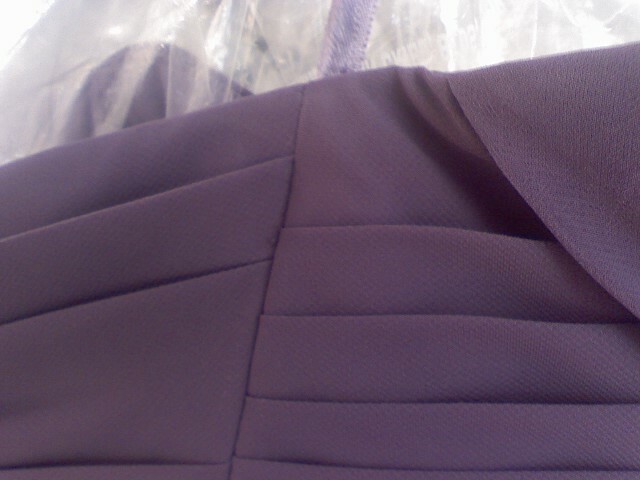 , it's time to begin preparing for prom and wedding alterations. Try to allow three weeks for prom and wedding party alterations, and six weeks for bridal gowns. We realize this is not always possible and will work with your time schedule in rush situations because we understand the importance of a perfect fit. By appointment, please! Last year we satisfied the fit expectations of hundreds of ladies needing special occasion gowns. Bridal gowns were fitted and/or restyled to be exactly as the bride envisioned. Several were major transformations and some brides chose to use their mother's gown - changing it to fit their personality. We love sharing our talent and being a part of making that one special event perfect. Call us soon so that we can become a part of your special day! (859) 278-4394. A big THANK YOU to all of my 2012 Brides! I have enjoyed fitting every single one of you and perfecting your gown from the major transformations down to minute details. I hope your gown was everything you dreamed it to be on your wedding day. My girls and I reap so much joy in having the God-given talent to serve your alteration needs. We feel honored to have played a small part in making your special day perfect and hope you allow us to serve all your family's alterations needs for many years to come. Thanks again and may God bless you as he has me. Have a "fit" with us! Walk-ins accepted. Appointments necessary for bridal & formal wear only. Hello, my name is Belinda Doty. After graduating with a Bachelors degree in Textiles, Clothing & Merchandising from University of Kentucky in 1978, I went in to pattern making for a clothing manufacturer. As a pattern maker, I learned the basis of garment construction and decided to pursue the alteration industry. I opened The Needle's Eye in 1983 and have been passionate about my work from its' inception. I am about to enter my 33rd year of high quality service and would love the opportunity to serve you!